Murder by Gaslight: Who Shot “Tonce” Joy? Fireman Doherty was on duty at the 3rd Street engine-house in Cincinnati in the early hours of Monday, November 30, 1896. A little after 3:00 a.m. he heard a gunshot coming from Muldoon’s Saloon across the street. He went to the door to see what had happened and was met by Pat Muldoon himself who rushed in and told Doherty to call a patrol wagon, someone had been hurt. Doherty sent for the wagon then looked across the street and saw two other men he knew—Billy Farrell was holding up “Tonce” Joy as if Joy was about to fall over. Joy was unconscious when the wagon arrived to take him to the hospital. Police officers stayed behind to question Muldoon and Farrell. They told the officers that no one else was in the saloon and they were playing cards when they saw “Tonce” Joy staggering outside his hand clasped to his stomach. He told them he had been shot and showed them the wound. Muldoon and Farrell had not seen the shooting and Joy had not told them what happened. The officers took their statements and left. Joy died in the hospital at 7:48 without ever regaining consciousness. Thomas “Tonce” Joy was a well-known sporting man in Cincinnati, likely to be seen on Vine Street at any time, day or night. Joy was 31-years-old—“a quiet, inoffensive man when sober, and even when drunk was not considered a desperate man.” But in his younger days, he had been a scrapper and carried the scars to prove it. He was a shoemaker by trade and in a melee, at a shoemaker’s ball someone drew a knife and gave Joy four deep slashes in his face. Joy was very nearly killed when a man named Smithy fractured his skull with a billiard cue. He was later stricken with paralysis; he no longer had the use of his left arm and his left leg could just bear his weight. Physically, he was not a threat to anyone. The following day Coroner Haerr performed a post-mortem examination and officially declared Joy’s death a murder. The angle of the fatal wound indicated that either Joy was laying down when shot or the killer held the gun low down and shot up in an underhanded way. Haerr was upset that the police officers had not arrested Ferrell and Muldoon at the scene of the shooting. In addition to being a saloonkeeper, Patrick Muldoon was a prominent ward heeler connected with the political machine of “Boss” George Cox. Billy Farrell was an ex-police officer. Friends of “Tonce” Joy said that there had been bad blood between Joy and Farrell, but no one knew the cause. 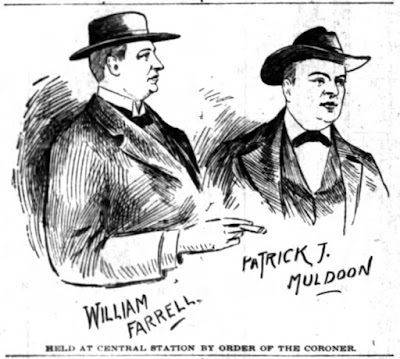 Muldoon and Farrell were brought to the police station and both were quite indignant when they were put under arrest. The story they told in police custody was essentially the same story they had told the night before, but the police knew these men and had a different theory. They believed that Joy, Muldoon, and Farrell had been playing cards with a fourth man who they were cheating. After their victim had been skinned, it was Joy’s job to steer him away. 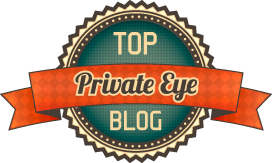 When Joy returned for his share, they wouldn’t pay, a fight ensued, and Joy was shot. The general impression was that Farrell had done the shooting and Muldoon was protecting him. On December 3, James K. Kelly, a saloonkeeper who worked for “Boss” Cox, and Attorney Cabell paid a visit to Police Chief Deitsch. They said that they had the man who killed “Tonce” Joy but did not give his identity. The man was a city official, ready to surrender provided Muldoon and Farrell were released on bond. Chief Deitsch was anxious to talk to the man but was not willing to release his prisoners. The following day the mystery man surrendered himself at the office of Coroner Haerr. His name was James Welton and he was a park policeman. He said he had been drinking with Joy, Joy got drunk and started to get abusive. Welton drew his revolver from his overcoat pocket. Joy grabbed him, a scuffle ensued, and the revolver went off. Joy said, “Oh, I’m shot.” Welton said, “I don’t believe you, but if you are it is your own fault.” Then Welton left him. The police were skeptical. It came out that Welton was a friend of the prisoners and owed his city job to Muldoon’s influence. They believed that Welton had confessed to an accidental shooting to take the heat off of Muldoon and Farrell. At the inquest, the coroner’s jury heard testimony against all three prisoners and there were a few surprises. Muldoon and Farrell changed their stories; they now said that Welton was in the saloon that night with two women. Joy came in and made some disparaging remarks about the women and Welton shot Joy in cold blood. Another witness also changed his story with contradictory results. 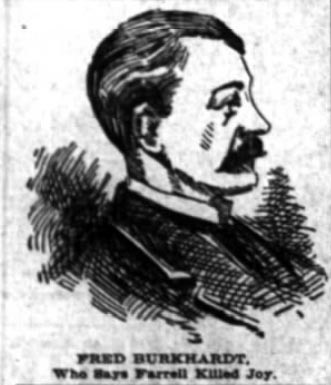 Fred Burkhardt, a waiter who had been walking home that night, first testified to seeing Muldoon, Farrell, and Joy together on the corner but saw nothing more. But after testifying his conscience overcame his fear and he returned to the stand to say he had seen Farrell and Joy scuffling and could say without any doubt that Billy Farrell shot “Tonce” Joy. The jury decided to err on the side of caution and charged all three with murder. When the case went before the grand jury, all the same evidence was presented but by now the police and prosecutors were convinced that Farrell was their man. But as the jury deliberated, four men known to have connections to “Boss” Cox refused to indict anyone but Welton. The District Attorney protested and managed to move the case to the next session with a less political jury. This time they followed the lead of the coroner’s jury and indicted all three. Farrell , Muldoon, and Welton each pleaded not guilty. Though the prosecutors were convinced that Farrell was the killer there was not enough evidence to prosecute. Eventually, all three were released on bond and were never brought to trial. The identity of “Tonce” Joy’s killer remains a mystery. “Criminal Business,” The Cincinnati Enquirer, May 20, 1897. “Delving,” The Cincinnati Enquirer, December 2, 1896. “Died,” The Cincinnati Enquirer, December 1, 1896. “Ferrell,” The Cincinnati Enquirer, December 5, 1896. “J. 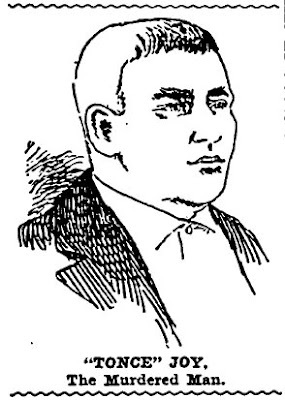 S.,” Kentucky Post, December 3, 1896. 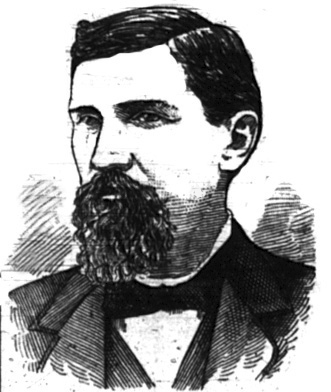 “Jim Welton,” Kentucky Post, December 4, 1896. “Murder,” Kentucky Post, December 1, 1896. “Murder In Sporting Circles,” The Daily Herald, December 1, 1896. “Shot to Death,” Kentucky Post, November 30, 1896. “Startling ,” The Cincinnati Enquirer, April 9, 1897. “'Tonce' Joy Murdered,” The Indianapolis News, November 30, 1896. “The Women ,” The Cincinnati Enquirer, December 6, 1896.